Union Facts is reporting today that over $1.1 billion dollars in union dues over a 6-year period was diverted to the democratic party and far-left organizations. This helpful analysis should be required reading for all Americans but especially those who are forced to pay union dues as a condition of their employment. 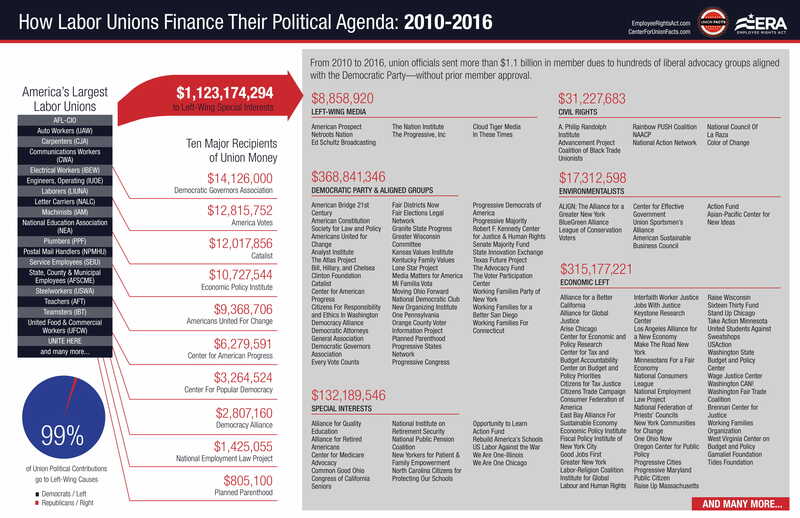 Be sure to look at the chart (also pasted in below) to see where the money goes: The Democratic Governors Association (Mark Dayton and Tina Smith) and Planned Parenthood are in the top ten. Think about it: in a country that prides itself on protecting citizen’s free speech rights, which includes the right NOT to speak and the right NOT to associate with a group or political party, we force people to support the political agenda of unions in order to keep their job. That is just wrong—especially when it is the government that collects the dues for government unions like the NEA. Employees never see the money; it goes right into union accounts. And who do unions collectively bargain with? Elected officials who either get union money from the unions or elected officials who are threatened with union money if they don’t go along with the union’s agenda. That warps our electoral politics and corrupts the legislative process. The fact that public sector unions like the National Education Association (NEA), almost exclusively support one political party, the Democratic Party and its affiliates, makes this bad policy especially outrageous. Are all teachers left-wing Democrats? No, many are more moderate liberals and conservative/libertarian Republicans. But we have gotten used to this; government unions have been around since about 1960 (and became official in 1973 here in Minnesota). New research from the Center for Union Facts shows that, from 2010 to 2016, labor unions sent more than $1.1 billion in member dues to anti-Republican advocacy groups—without prior member approval. It is the most comprehensive analysis of union advocacy spending ever done. The Clinton Foundation, Democratic Governors Association, and Planned Parenthood featured prominently, even though 40 percent of union household members vote Republican in any given election cycle. Under current labor law, union officials can spend dues money on political advocacy without obtaining opt-in permission from their members. The Employee Rights Act, which is now co-sponsored by more than 170 members of the House and Senate, would protect employees by requiring union leadership to obtain prior approval before spending dues money on political advocacy. Roughly 80 percent of Americans—including those in union households—support the paycheck protection provision and other ERA reforms.